Preheat the oven to 350 degrees F. Butter a 9- by 13- inch baking dish with softened butter. 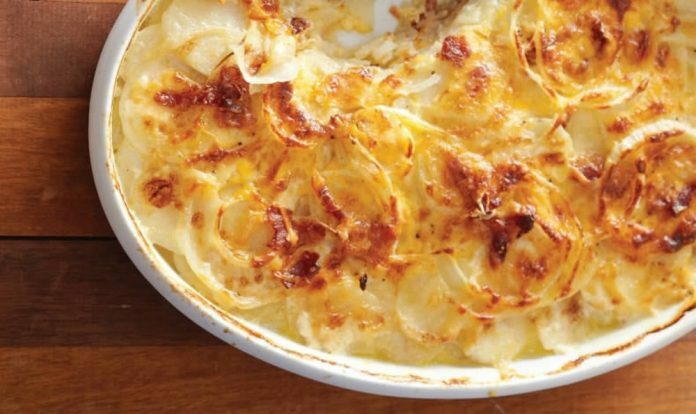 Cover the bottom of the baking dish with one-third of the potatoes. Top with one-third of the onions and garlic. Dot with 1 tablespoon of the butter and sprinkle with 1/3 of the crumbled bacon. Top with 1/3 each of the Gouda and Cheddar cheeses. Repeat steps with the remaining ingredients in two more layers, ending with the layer of cheese on the top.